Recently I saw a poster of a globe projecting light with the text in the title above. There was some discussion about what “divine civilisation” could mean. Some thought it referred to a future civilization as an entity, others discussed what characteristics a “divine civilisation” might have. So let’s look at what Abdul-Baha wrote and the context for this quotation. The English text above comes from the book, Foundations of World Unity (pages 28-33) which doesn’t give any indication of a source, however there is a corresponding text in the 1919 Tablet to the Hague in Persian. This text is also in Selections from the Writings of ‘Abdu’l-Bahá, published in 1978. Some could argue that all three texts say the same thing and I’d agree the differences are minimal. All three texts refer to the divine (spiritual or spiritualized) as being what gives purpose (or illumination) to the material and all three texts refer to material and divine in the present continuous (not something yet to happen), however personally if quoting an author, I prefer to use text that reflects visual metaphors intended by the author. Literally in the Persian the text (here at line 9) is: Material civilization is like the glass (In Persian when an article is not indicated it means ‘the’)”. The next phrase (there’s no punctuation in the Persian) “divine civilisation is like the lamp (saraaj)” makes it clear that “glass” is a lantern or glass of a lamp. In turn the first phrase tells us that “lamp” in the second phrase refers to what illuminates and not the physical structure so ‘flame’ is as accurate as the word lamp here. In the two other translations “a” is used and the translators were most likely thinking of ‘any’ or ‘all’ various lanterns, whereas it seems that Abdul-Baha chose to indicate ‘the’ glass (in Persian it is a choice) and in doing this there’s a reference to the Platonic idea of the universal glass (lantern). I realise this is a slight difference of meaning in English but I found it interesting, and here using ‘a lantern’ or ‘the lantern’ doesn’t affect the flow of the words in English either way. In Persian there’s a word for light (nur) which Abdul-Baha could have used and didn’t and so that’s the argument for using the word flame here. Also a flame can be blown out and in a lantern it needs the glass to function, whereas light is more abstract (and hence independent). 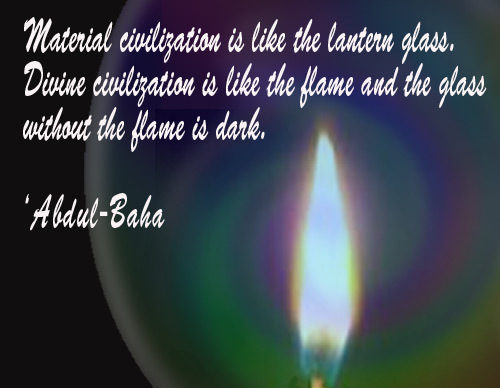 So there’s a reference to the interrelation between the material and the divine and this could be a reason why Abdul-Baha did not choose the word for light. For me this was a nuance I would have missed in the first translation – the complimentary natures of the material and the spiritual or divine, even though in this metaphor, it is the spirit that is the source of light. So what is divine civilisation? I’d say divine civilisation refers to the spiritual or spirited – so a society or societies which are characterized by values such as justice, equality, etc. The Persian word used for civilization is “madaniyyat” which has the meaning as in the phrase, Roman Civilization, meaning aspects of a way of life and the achievements of a people in a period. In 1915 representatives from 9 European countries and the United States, formed the Central Organization for a Durable Peace in the Netherlands at The Hague. Their constitution was published in newspapers around the world. In Tehran, Iran, it was published in the Iran News and Mr Ahmad Yazdani in consultation with Mr Ibn-i-Asdaq, prepared a paper outlining the Baha’i principles and sent this to the Organization with the suggestion that they seek guidance from Abdu’l-Baha in their goal of establishing permanent global peace. The Organization responded by sending a letter written in 1916 to Abdu’l-Baha via Mr. Yazdani. In the tablet, `Abdu’l-Bahá gives an overview of the Bahá’í principles: a declaration of universal peace, independent investigation of reality; the oneness of humanity; religion must be the cause of fellowship and love; religion must be in conformity with science and reason; the abandonment of religious, racial, political, economic and patriotic prejudices, a universal auxilliary language, equality of women and men, a voluntary sharing of one’s wealth (property), that each individual must be free (emanicipated), that religion is important for teaching morality; material civilization must work with divine civilization; education for all children; justice and rights. “Regarding the economic prejudice, it is apparent that whenever the ties between nations become strengthened and the exchange of commodities accelerated, and any economic principle is established in one country, it will ultimately affect the other countries and universal benefits will result. Then why this prejudice? You are currently browsing the Just a Bahai Blog blog archives for November, 2013.